The Bahía culture arose on the coast of what is now Ecuador, between Bahía de Caráquez and Isla de la Plata. They inhabited a transition zone between the semi-desert and forest environments, with an ideal climate that was somewhat wetter than at present. The Bahía people practiced agriculture, but their economy was also based on extracting marine resources and they were adept sailors, as shown by the presence of archaeological remains on Isla de la Plata, an island located some 50km (30 miles) from the coast. 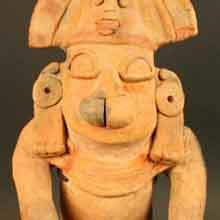 The Bahía culture is best known for its modeled ceramics. Some pieces appear to represent temples and contain human figurines with two snakes as staffs or scepters. Other works in ceramic represent animals, cradles, personal ornaments such as nosepieces and earpieces, and musical instruments. The most common are figurines made in a realistic style, showing richly dressed persons with deformed heads. Some figurines appear to show tattoos or body painting. The Bahía people also were skilled in crafting objects from stone, metal, seashells, wood and bone and made textiles and baskets for everyday life and ceremonial purposes. This culture was organized into chiefdoms, led by chiefs who held political and religious power. Bahía society was hierarchical, with class differences based on expertise and wealth. 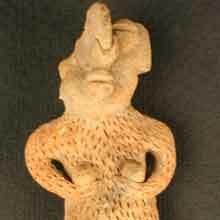 Ritual activities played a central role in the everyday lives of the Bahía people, as shown by the remains found on Isla de la Plata, where many ceramic figurines have been found and yet no dwellings or remains indicative of domestic or everyday activities have been identified. The island is believed to have been a site of pilgrimage related to the sun, as most figurines have been found on the eastern side of the island, where the sun rises. On the mainland, similar figurines have been found in graves found in dwellings that are thought to have been burned down as funeral pyres. The Bahía culture shows planned settlements composed of ordered buildings and housing up to 5000 people. These small urban centers had public areas such as plazas and temples, as well as residential zones. Ceramic models suggest that temples, and perhaps even the dwellings of high-ranking individuals, were rectangular in shape and had pitched roofs, with a chimney-like structure in the center. The Bahía culture arose from the earlier Chorrera groups, but unlike their predecessors they practiced more intensive agriculture and their settlements reached an almost urban scale. 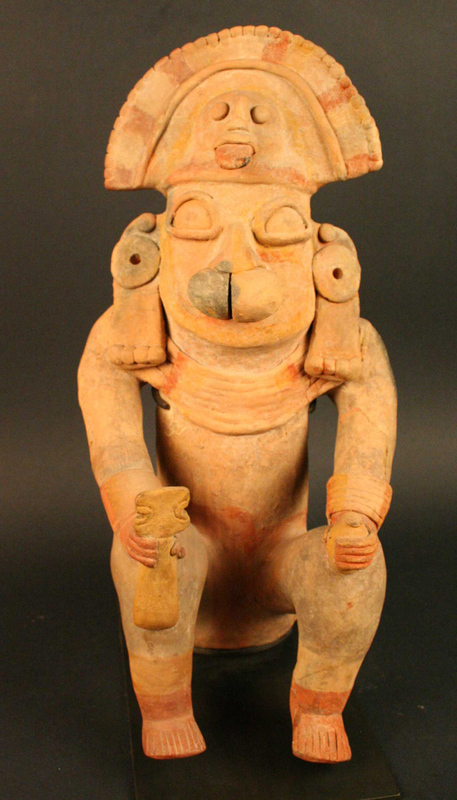 The culture exhibits features associated with other contemporaneous groups that inhabited the Ecuadorian coastal region, such as the Guangala, Jama-Coaque, and La Tolita cultures, with which they shared some technologies and elements of ceramic decorative style.